The concept of one-design sailing hinges on the idea of honing a sailor’s skills right next to his or her opponent’s. Is there a better way for a sailor to improve and stay motivated? 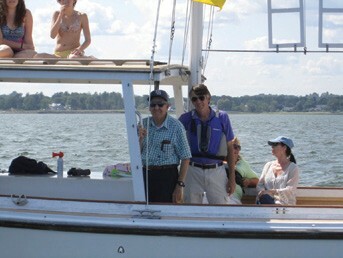 This story of one-design sailing on Long Island Sound begins with a testimony to the dedication and contributions of Edward Austin “Ted” Jennings II (1929 – 2016) of Southport, Connecticut. 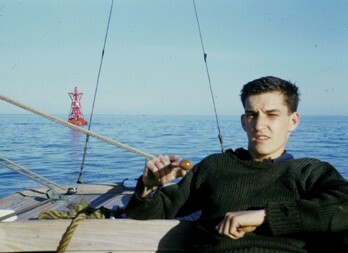 A young Ted Jennings at the helm of an Atlantic on Long Island Sound, just outside Southport Harbor. It began with Atlantics in the 1940s and 1950s; that concept of one-design competition where you could test your sailing skills on a level playing field. Then Dyer Dhows opened the door for pitting sailor against sailor at Pequot Yacht Club, right in Southport Harbor, all winter long. And the Solings made an entrance in the late 1960s and endured into the 1970s. Past Commodore Hugh Smith remembers, “Ted was a strong competitor out on the water, and his very positive presence will be fondly remembered by those who served with him as Elected Governor or as a member of his One-Design Committee. Ted was also one of the inventors of the Special Activities Membership idea, which made the whole Ideal 18 program work and allowed the club to prosper. Another one of his accomplishments was bringing (along with Clark duBois) the Community Sailing of Fairfield program to fruition.” Clearly, Ted had a passion for sailing, and a calling for sharing that passion with others. Terri Jennings is a freelance writer/editor living in Easton, CT. She is the daughter-in-law of the late Ted Jennings. Her husband, Ward Jennings, is a lifelong member of Pequot Yacht Club in Southport, and currently serves as Vice Commodore. Their two children, Austin and Kate, are proud graduates of the Junior Program at Pequot.